Baltimore is also home to the Basilica of the National Shrine of the Assumption of the Blessed Virgin Mary, the country’s first Roman Catholic cathedral. The neoclassical design by architect Benjamin Latrobe, best known for his work at the U.S. Capitol, was called “North America’s most beautiful church” by architectural historian and critic Sir Nicholas Pevsner. Most visitors focus on the dome above the crossing, but the canopied archbishop’s throne (aka the cathedra) and two paintings gifted by King Louis XVIII of France in 1821 are noteworthy. Another historic church is St. John’s Episcopal in Waverly, one of the city’s many neighborhoods. The antebellum church and its adjoining churchyard wouldn’t be out of place in an English village, which is fitting given that Waverly, originally known as Huntingdon, was a village in its own right until annexation by Baltimore in the late 19th century. The present-day Gothic Revival edifice with its magnificent interior was built between 1858 and 1859 as a replacement for the original structure that fell victim to a fire. Beyond the spires, there is Fort McHenry. The old fort not only defended Baltimore against British attack but it maintained what was left of the country’s dignity only weeks after Washington was sacked and the White House burnt. The Royal Navy’s bombardment was immortalized by Francis Scott Key, whose words — you know, “the rockets’ red glare, the bombs bursting in air” — would later become the national anthem known the world over as “The Star-Spangled Banner.” One of the better preserved forts anywhere in the continent, it has been a national monument under the care of the National Park Service since 1939. Even more history can be found along the waterfront of the Inner Harbor at the Historic Ships in Baltimore, where four vessels, including the circa 1854 USS Constellation, are moored. In the warmer weather a walk further along the quay to Fell’s Point is highly recommended. The city’s oldest extant neighborhood, which largely survived the Great Fire of 1904, exudes the kind of authenticity that is impossible to replicate with revivalist architecture and modern urban planning. 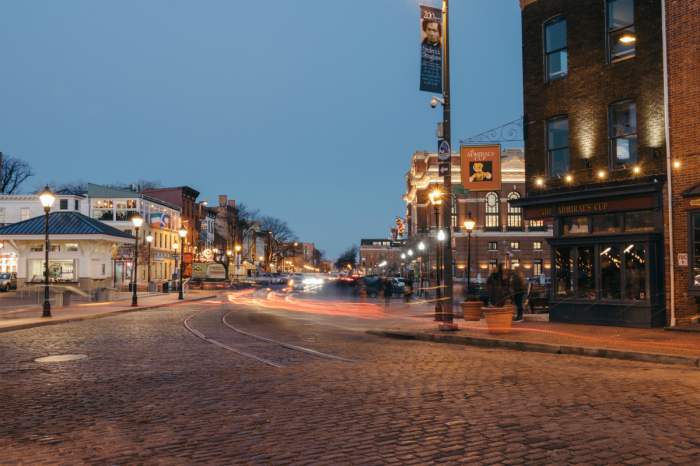 Think cobblestone streets, period townhomes and some of Baltimore’s best bars. It’s also here where you can see signs of redevelopment as swaths of the waterfront from downtown to Fell’s Point have changed in recent years, including with the addition of the super luxurious Four Seasons Hotel. I stayed at the Delta by Marriott Baltimore Inner Harbor, a downtown hotel with a perfect location. Tell Tale, the hotel restaurant, has surprisingly good food but seems forgotten, both by management and guests. Fresh seafood competes with the view of Baltimore’s cityscape at Rusty Scupper, which has been popular with locals and visitors alike for more than 30 years. The wine list even includes Maryland wine, which is actually a thing. No visit to Baltimore is complete without a crawl through the city’s iconic markets, particularly Lexington Market and the Broadway Market, the latter of which will reopen later this year in Fell’s Point. The made-to-order crab cakes at Faidley Seafood, tucked away in Lexington Market, are divine. Baltimore is easily reached by car, rail or air. Baltimore/Washington International Thurgood Marshall Airport, which as its name suggests serves the entire national capital region, is served by all the major airlines.